An Indian-American woman elementary teacher from Texas has been honored by US President Barack Obama at the White House for her excellent work in the field of education. 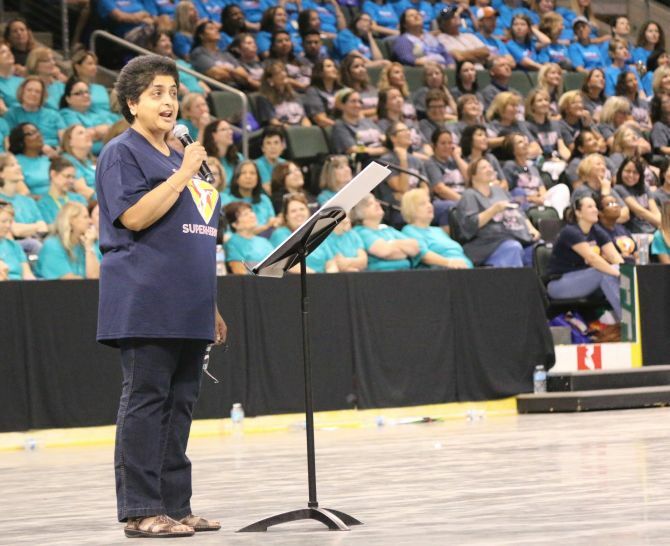 Revathi Balakrishnan, a gifted teacher at Patsy Sommer Elementary School, was also named 2016 'Texas Elementary Teacher of the Year'. "It is not work for me. It is actually a passion," said 53-year-old Austin-based Balakrishnan who has taught in the district's talented and gifted programmes for nine years. Currently teaching math classes in third through fifth grade at Sommer, Balakrishnan, who was honoured last week, will now represent Texas in the 'National Teacher of the Year' competition. "I'm an Indian-American, so I think the Indian community is feeling a lot of pride and joy," Balakrishnan said, adding that about 30 per cent of the students at 'Sommer Elementary' are Asian or Indian. "I feel proud to represent those and I can convince a lot of younger generation Indian kids to turn to teaching for a career. So I feel I can actually have some impact on that," she said. Balakrishnan has taught at 'Sommer Elementary' for six years before teaching at Forest North Elementary for three years. Originally from Chennai, Balakrishnan was a systems analyst with Liberty Mutual, managing databases and programming for about 12 years before becoming a teacher. Terming her style of teaching as "no nonsense", Balakrishnan, who earned her economics degree from University of Madras, attributes her success in the field of education to her love of teaching. She said the excitement of teaching, learning with students and the opportunity to shape students who are the "leaders of tomorrow" drives her. "Not one day is the same, which is what I like. I don't like structure. I just go with the flow and I love what happens," Balakrishnan said. The 'National Teacher of the Year Programme' identifies exceptional teachers in the country, recognises their effective work in the classroom, engages them in a year of professional learning, amplifies their voices and empowers them to participate in policy discussions at the state and national levels.